Dr Sarfati, a Ph.D. chemist, explores some of the most-cited ‘explanations’ of biochemical evolution, and shows how they point to a Creator, not ‘time and chance’. An animation of the basics of a cell’s protein synthesis system. Origin-of-life scenarios need to explain how this came into existence without (supernatural) intelligent design (see points 14 and 15). There is almost universal agreement among specialists that earth’s primordial atmosphere contained no methane, ammonia or hydrogen — ‘reducing’ gases. Rather, most evolutionists now believe it contained carbon dioxide and nitrogen. Miller-type sparking experiments will not work with those gases in the absence of reducing gases. See The Primitive Atmosphere. The atmosphere contained free oxygen, which would destroy organic compounds. Oxygen would be produced by photodissociation of water vapour. Oxidized minerals such as hematite are found as early as 3.8 billion years old, almost as old as the earliest rocks, and 300 million older than the earliest life. There is also evidence for organisms complex enough to photosynthesize at 3.7 billion of years ago (Rosing, M.T. and Frei, R., U-rich Archaean sea-floor sediments from Greenland—indications of >3700 Ma oxygenic photosynthesis, Earth and Planetary Science Letters 217:237–244, 2004). Also, red jasper or hematite-rich chert cored from layers allegedly 3.46 billion years old showed that ‘there had to be as much oxygen in the atmosphere 3.46 billion years ago as there is in today’s atmosphere. To have this amount of oxygen, the Earth must have had oxygen producing organisms like cyanobacteria actively producing it, placing these organisms much earlier in Earth’s history than previously thought.’ (Deep-sea rocks point to early oxygen on Earth, 24 March 2009) NB: these ‘dates’ are according to the evolutionary/uniformitarian framework, which I strongly reject on both biblical and scientific grounds — see How long were the days mentioned in the Biblical creation account? and Evidence for a Young World). Catch-22: if there was no oxygen there would be no ozone, so ultraviolet light would destroy biochemicals. Also, the hydrogen cyanide polymerization that is alleged to lead to adenine can occur only in the presence of oxygen (see Eastman et al., Exploring the Structure of a Hydrogen Cyanide Polymer by Electron Spin Resonance and Scanning Force Microscopy, Scanning 2:19–24, p. 20). All energy sources that produce the biochemicals destroy them even faster! The Miller–Urey experiments used strategically designed traps to isolate the biochemicals as soon as they were formed so the sparks/UV did not destroy them. Without the traps, even the tiny amounts obtained would not have been formed. Biochemicals would react with each other or with inorganic chemicals. Sugars (and other carbonyl (>C=O) compounds) react destructively with amino acids (and other amino (–NH2) compounds), but both must be present for a cell to form. Without enzymes from a living cell, formaldehyde (HCHO) reactions with hydrogen cyanide (HCN) are necessary for the formation of DNA and RNA bases, condensing agents, etc. But HCHO and especially HCN are deadly poisons — HCN was used in the Nazi gas chambers! They destroy vital proteins. Depolymerisation is much faster than polymerisation. Water is a poor medium for condensation polymerisation. Polymers will hydrolyse in water over geological time. Condensing agents (water absorbing chemicals) require acid conditions and they could not accumulate in water. Heating to evaporate water tends to destroy some vital amino acids, racemise all the amino acids, and requires geologically unrealistic conditions. Besides, heating amino acids with other gunk produced by Miller experiments would destroy them. 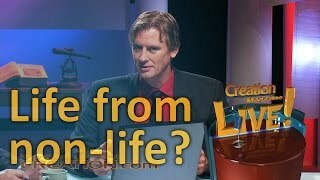 See Origin of Life: The Polymerization Problem. Polymerisation requires bifunctional molecules (can combine with two others), and is stopped by a small fraction of unifunctional molecules (can combine with only one other, thus blocking one end of the growing chain). Miller experiments produce five times more unifunctional molecules than bifunctional molecules. See Origin of Life: The Polymerization Problem. Sugars are destroyed quickly after the reaction (‘formose’) which is supposed to have formed them. Also, the alkaline conditions needed to form sugars are incompatible with acid conditions required to form polypeptides with condensing agents. See The RNA World: A Critique. Long time periods do not help the evolutionary theory if biochemicals are destroyed faster than they are formed (cf. points 4, 7, & 9). Not all of the necessary ‘building blocks’ are formed; e.g. ribose and cytosine are hard to form and are very unstable. See Origin of life: Instability of building blocks. Life requires homochiral polymers (all the same ‘handedness’) — proteins have only ‘left-handed’ amino acids, while DNA and RNA have only ‘right-handed’ sugars. Miller experiments produce racemates — equal mixtures of left and right handed molecules. A small fraction of wrong handed molecules terminates RNA replication, shortens polypeptides, and ruins enzymes. See Origin of Life: The Chirality Problem and Homochirality an unsolved problem (quote). Life requires catalysts which are specific for a single type of molecule. This requires specific amino acid sequences, which have extremely low probabilities (~10–650 for all the enzymes required). Prebiotic polymerisation simulations yield random sequences, not functional proteins or enzymes. See Proteins and Casket Draws, Could monkeys type the 23rd Psalm? and Cheating with Chance. The origin of coding system of proteins on DNA is an enigma. So is the origin of the message encoded, which is extraneous to the chemistry, as a printed message is to ink molecules. Code translation apparatus and replicating machinery are themselves encoded — a vicious circle. A code cannot self-organize. See Self-Replicating Enzymes? The origin of machines requires design, not random energy. E.g: the Nobel prize-winner Merrifield designed an automatic protein synthesiser. Each amino acid added to the polymer requires 90 steps. The amino acid sequence is determined by a program. A living cell is like a self-replicating Merrifield machine. 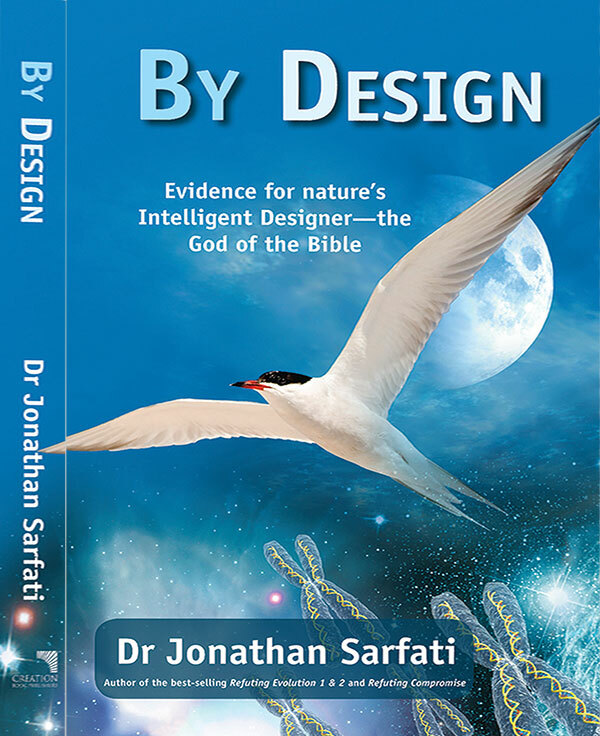 Author: Dr Jonathan Sarfati presents case after case for amazing design in the living world, and demolishes theories of chemical evolution of the first life. Yet unlike many in the prominent Intelligent Design Movement, he is up-front about the truth of the Bible. This enables him to refute many anti-design arguments, and answer the key question: ‘Who is the Designer?’ (High School–Adult) 260 pages. See also Guest review of the book.